One is high-end apparel. 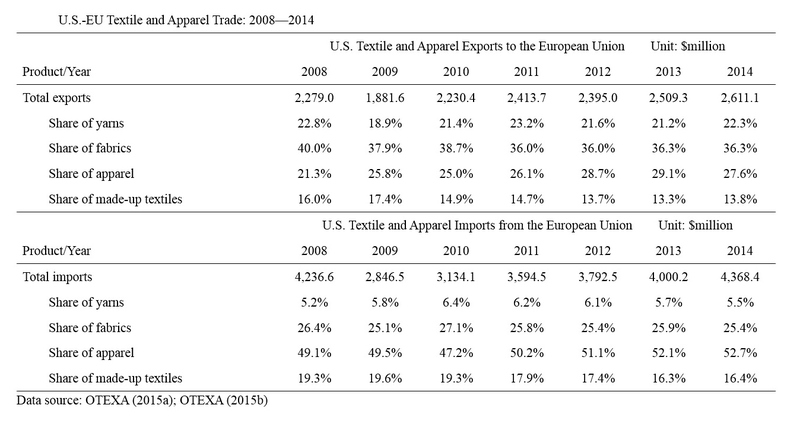 The United States is EU’s third largest apparel export market only after Switzerland and Russia. 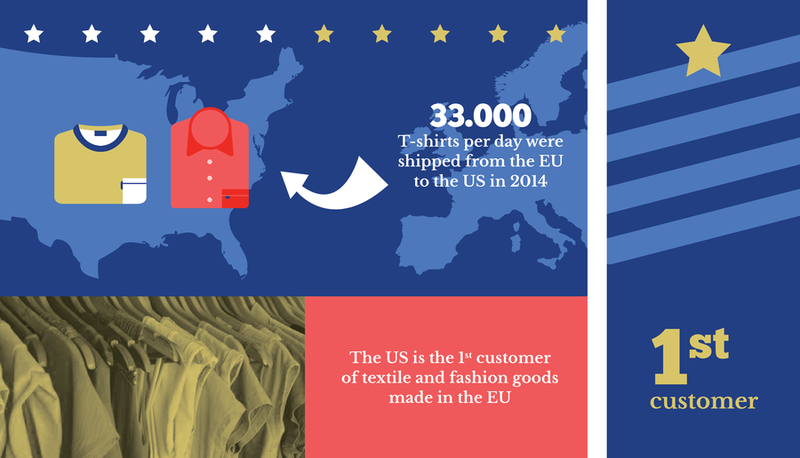 In 2014, apparel exports from EU(28) to the United States exceed €2.5 billion and most products were much higher priced than those exported from elsewhere in the world. Euratex expects that when the high tariff facing EU apparel products in the U.S. market is removed—such as 28% tariff rate for women’s jacket, and customs red tape is cut, many small and medium (SME) sized EU T&A companies will be able to gain more access to the 300 million people U.S. apparel market. Moreover, it seems that the EU technical textile industry is very interested in getting access to the U.S. market currently protected by the Berry Amendment. Euratex sees “Opening business opportunities in public sector for technical textiles is a must in T-TIP. “Europe is a recognized leader in production of smart technical textiles due to advanced manufacturing technologies and constant innovation of materials and their application. The production of technical textiles in Europe significantly increased over the past ten years. With TTIP, the US public services will be able to benefit from the innovative products manufactured in Europe.” Euratex says. It will be interesting to see if the T-TIP passes. I think that the US will benefit from the high-end apparel tariffs being reduced, which will give the US a broader high-end apparel market. I am interested to see if the US importing technical textiles from the European Union will decrease the US’s own production of technical textiles, and the US is no longer making technical textiles, what they will start producing – maybe 3-D printers? It is also interesting to see that the US imports and exports from the European Union have both overall increased over the years. I would have expected one to increase, but not both. Good comment! I agree that T-TIP will potentially help reduce the tariff rate for high-end apparel made in EU and may open new markets for technical textiles made in the US. My personal observation is that EU T&A industry overall is more excited about T-TIP than US T&A industries. This may change however since TPP negotiation is now concluded. I believe that the T-TIP will be beneficial to both the US and Europe because it will affect high end apparel and technical textiles. These are both very unique and important sectors in the global economy. With the overflow of mass market cheap production, it is important to still focus on the production of high end apparel and products that will last longer. Focusing on high end products provides emphasis on sustainability of clothing and how buying a quality garment has the ability to make less of a footprint on the world because of its longer shelf life/ usage. The medical field is an extremely important industry that will only continue to grow as well, which is why technical textile production is imperative. People often forget that there is more than just fashion garments for textile production, the medical field is an important component that cannot be forgotten and it is important to create relations that will help this aspect. agree! technical & industrial textiles are gradually becoming the new market opportunities as well as “battle ground”. They are very high-tech driven, and more complicated in terms of supply chain and usage. hope to cover more discussions on technical textiles in FASH455 in the future. I feel that if implemented, the T-TIP will be a great success for both Europe and the United States. It will benefit high-end apparel by relieving some of the tariffs which will increase profits. It will benefit technical textiles by giving the EU greater access to the United States. The United States will be especially benefiting from the T-TIP regarding technical textiles because there is such a large demand for these textiles. It will be interesting to see the changes that will occur if this is implemented. On the other hand, the US textile industry is very concerned about EU asking for getting access to the government procurement market which is currently protected by the “Berry Amendment”. Technical textiles are a HUGE up-and-coming sector of the current T&A industry. If the T-TIP can be an advantage to the United States in further progressing their technical textiles, I think that the U.S. will benefit and take much pride in the results. The global industry will benefit entirely as well. The success of the T-TIP is important and if there are any hiccups and/or detriments, I feel that large losses will be sacrificed. With any agreement, I think it is easy to become wrapped up in the positives of what MAY happen, but it is always quite important to keep a healthy sense of skepticism to prepare for any plausible risks. I think it would be interesting to see T-TIP implemented. I think it could benefit the EU as well as the United States in terms of textiles and higher-end apparel. This will help grant the EU greater access to the US however i question if this is something the US, specifically the textile industries in the United States would be interested in?